Crumbles are great for the warmer months. They can be made with pretty much any fruit, are super simple and pair well with a scoop of vanilla ice cream on top. Summer is an ideal time for cherry pie, blueberry pie and strawberry rhubarb pie… How about making one of those into a crumble? 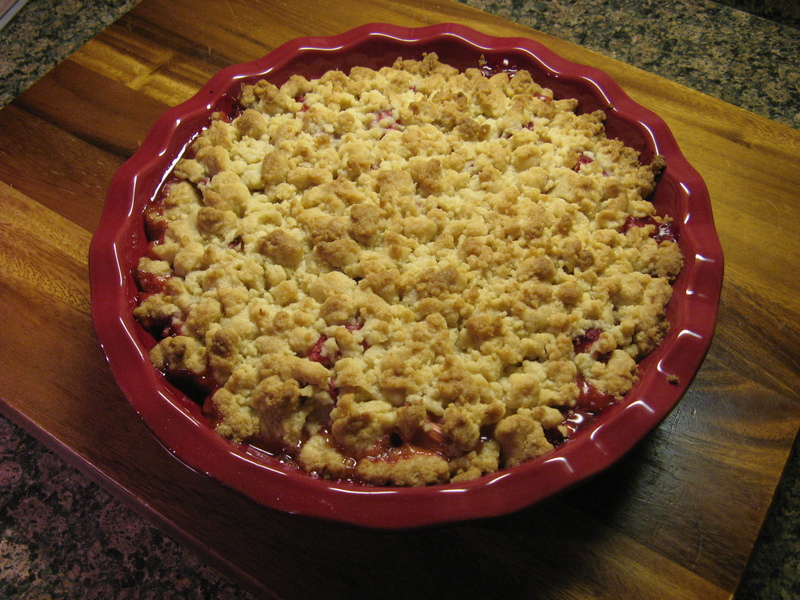 Today, I am bringing you just that… A Strawberry Rhubarb Crumble. A little backstory on Rhubarb… You may think that rhubarb is related to celery because it pretty much just looks like red celery and that it is a fruit because it’s primarily used in dessert, but, both accounts are wrong. Rhubarb and celery while they may look alike are not part of the same family, and based on the theory that fruits have seeds, rhubarb is not a fruit. Rhubarb is used in baking because its tart flavor will not become overly sweet when added with sugar and other sweeteners. To me rhubarb tastes like an unripen apple. If you’re keen on tart flavors then raw rhubarb may be perfect for you, but, avoid eating its leaves as they contain high levels of oxalic acid which can cause kidney damage, granted, you would have to eat a pretty hefty amount, but even a small amount can make you sick so why take the chance. Anyhoo, back to the crumble. I began by making the topping… I mixed flour, baking powder, granulated sugar, light brown sugar and lemon zest in a bowl. I then added in melted butter and stirred all of the ingredients together until it formed into clumps and then refrigerated it for 10 minutes. In another bowl I made the filling by tossing together chopped rhubarb, quartered strawberries, lemon juice, granulated sugar, salt and to thicken the filling, cornstarch. I transferred this to a 9-inch deep dish pie plate and let it sit for 10 minutes. And baked it in a 375 preheated oven for about 45 minutes. Until the filling was bubbly. 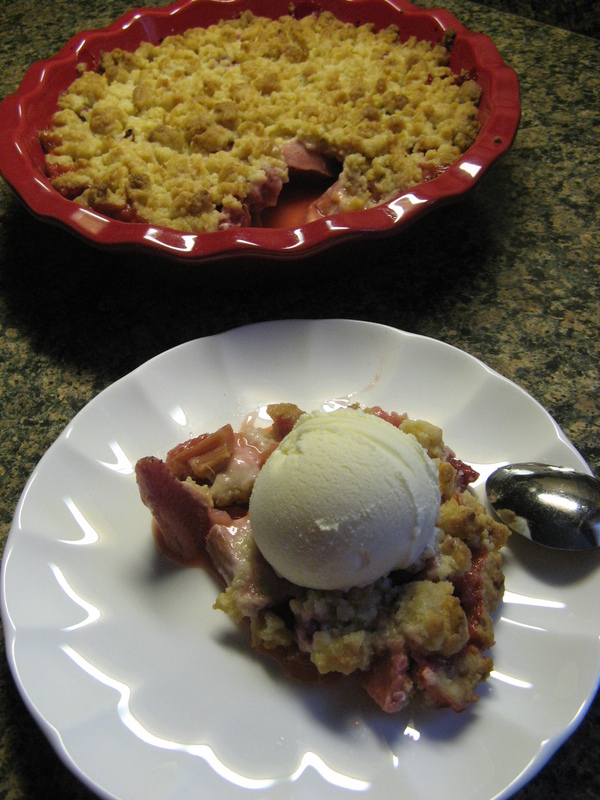 I let the crumble rest for a bit and then enjoyed some with what else, a scoop of vanilla ice cream. 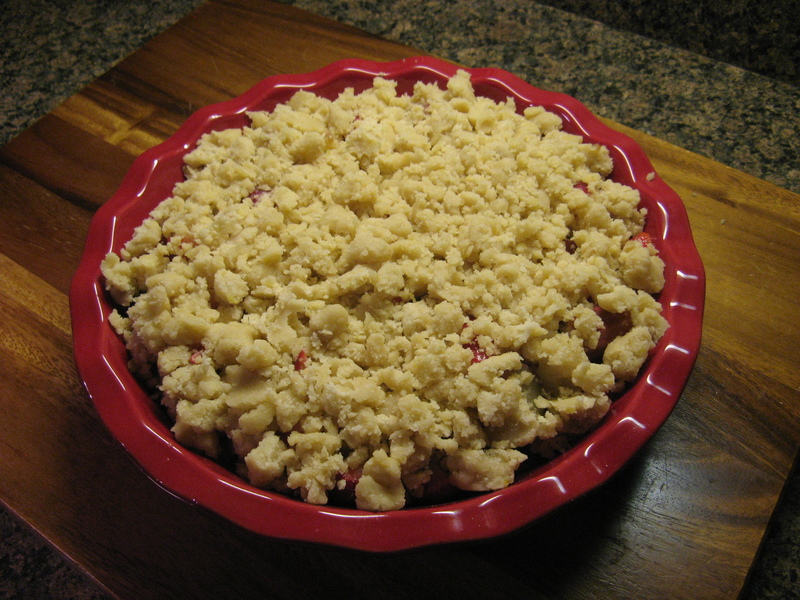 If you’re looking for some more easy summer cakes to make check out the Dump Cakes I posted about a few years ago or the Apple Streusel Dump Cake I made for Thanksgiving last year. And, if you happen to buy too much rhubarb and need another recipe to try out, check out these Rhubarb Cupcakes. 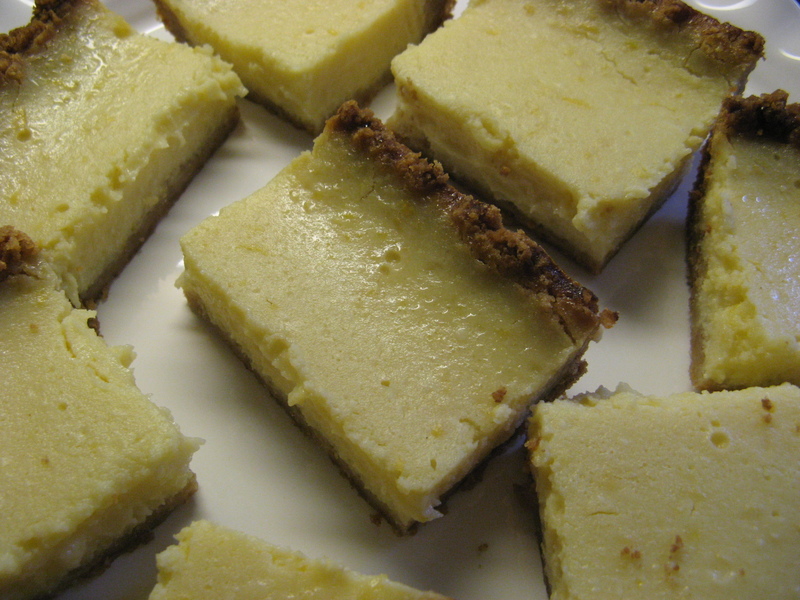 Make the topping: In a medium bowl combine the flour, baking powder, both sugars and the lemon zest. Add the melted butter and stir the mixture until it forms small and large clumps. Refrigerate for 10 minutes. 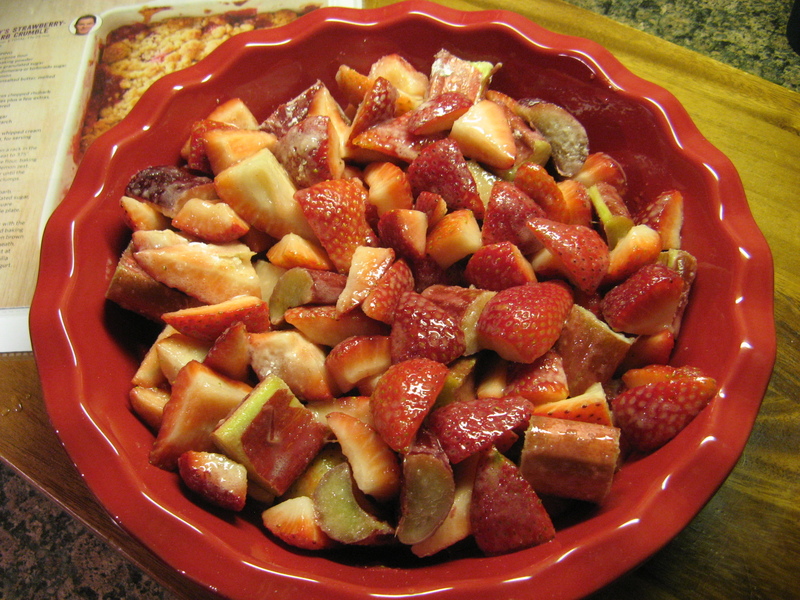 Make the filling: In a large bowl combine the rhubarb, strawberries, lemon juice, sugar, salt and cornstarch. Let rest for 10 minutes and then transfer to a 9-inch deep dish pie plate or a 9-inch square baking dish. Top the filling evenly with the topping mixture and place the dish on a foil lined baking sheet. Bake until the topping is golden brown and the filling is bubbling, about 40 to 50 minutes. Let the crumble rest for at least 15 minutes before enjoying. Serve warm and store leftovers in the refrigerator. I always have a container of ricotta cheese in my fridge just in case I want to make a baked ziti, a cheesecake or something or other. Unfortunately what ends up happening is, it sits in my fridge, I know it’s there, but I don’t get around to using it until it’s about to expire and then I’m scrambling to make something because I don’t want to throw it out. 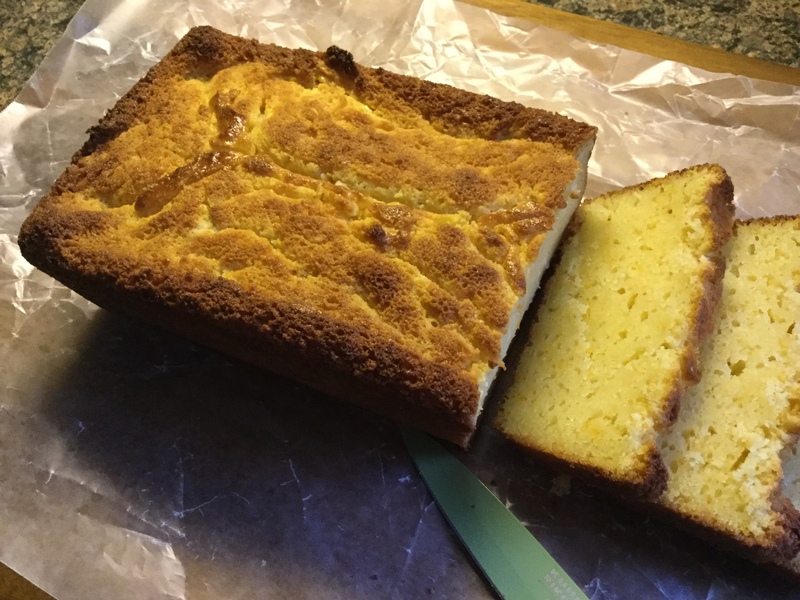 When this recently happened I decided to make something I made a few years ago, but didn’t come out quite right the first time… a Ricotta Orange Pound Cake. This cake has a nice orange taste and is quite moist thanks to the ricotta cheese. *If you don’t have cake flour, use this method to substitute with all-purpose flour and cornstarch. Preheat the oven to 350 F. Grease a loaf pan with butter, or spray with cooking spray. In a medium bowl combine the flour, baking powder and salt. Stir to blend. With a mixer, cream together the ricotta cheese, butter, and sugar until light and fluffy. Add the eggs, one at a time, beating well after adding each one. Add the vanilla, zest and amaretto and beat until well combined. Add the dry ingredients, a little at a time, and mix until just incorporated. Pour the batter into the prepared pan and bake until a cake tester or toothpick inserted in the middle comes out clean and the cake pulls away from the sides of the pan, about 45 to 50 minutes. If you find you need to bake it a little longer, you may want to lower the temperature of the oven to ensure that you don’t burn the cake. Let the cake cool in the pan for 10 minutes and then transfer to a wire rack to cool completely. It’s the first day of spring and unfortunately the temperatures aren’t spring-like and there’s snow in the forecast for tomorrow. Too bad the weather doesn’t automatically switch with the seasons – of course people would only enjoy that for the warmer months. Not many people would be too keen on frigid temps and snow the first day of winter, although it would make for a white Christmas! I’m welcoming spring today with a lemon treat. I’m not all that sure that lemon is synonymous with spring – I think it more of a summer flavored dessert – but, when I Googled Spring desserts a bunch of lemon ones were the first to come up. 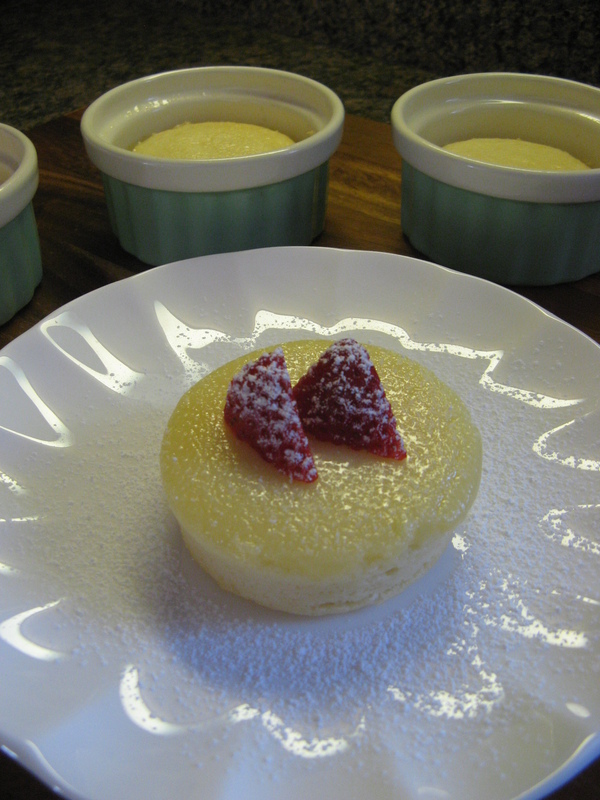 So, the lemon treat I settled on was Lemon Pudding Cakes. I started by making the lemon base of the cakes by mixing together egg yolks, buttermilk, lemon juice and zest. Once those ingredients were well combined, I sifted in flour, sugar and salt and mixed these ingredients until combined. Next I beat the egg whites until stiff peaks formed. Now, we all have those kitchen tasks we’re not fond of doing. I used to dislike having to mince garlic until I purchased a garlic mincer. Another task I dislike, beating egg whites into stiff peaks, well by accident, well not really accident, I finally realized what I was doing wrong… I was using the wrong bowl. I would normally beat them in a wide stainless bowl and I guess it would take long because of the larger surface of the bowl. I didn’t feel like grabbing that bowl when making these pudding cakes so I grabbed a smaller stainless bowl instead and my egg white were ready in half the time. I apologize to those of you who are like “Duh.” Sometimes we get so used to doing things a certain way we don’t stop to think of a more efficient way to do it. After the egg white were ready I folded them – a small amount at a time- into the lemon mixture. I then divvied up the batter among 4 ramekins and baked them in a water bath. After letting them cool, I inverted them on a dish and topped them with fresh strawberries and confectioners’ sugar. I knew these were going to be delicious, but, I was surprised by just how good they are. The cake texture was reminiscent of a ricotta cheesecake and there was a nice layer of lemon pudding on top… Hence, a Lemon Pudding Cake. This was a quick dessert if you are looking for a nice dessert for a small get together or, you just want a dessert that will remind you of the warmer temps that are sure to come. In a large bowl add egg yolks, buttermilk, lemon juice and lemon zest and using a hand mixer beat until well combine on medium speed. Sift in flour, sugar and salt into the mixture and beat on low until well combined. In a separate bowl, beat egg whites until stiff peaks form. Gently fold the egg whites into the lemon mixture a little at a time until completely incorporated. Divide the batter evenly among the ramekins and bake in a water bath. Place the ramekins in a large roasting pan and fill hallway with water. Bake for 45 minutes until the top springs back when gently pressed. All the cakes to cool slightly and then invert onto a plate and garnish with fresh berries and confectioners’ sugar. **I sprayed my ramekins with cooking spray then sprinkled sugar in them. 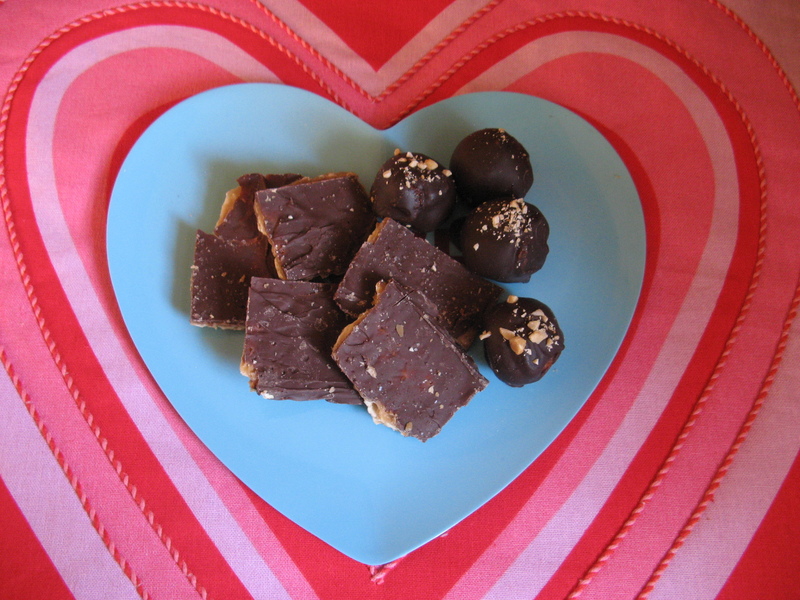 Are you thinking of making some homemade treats for your Valentine? Or, maybe something for yourself? 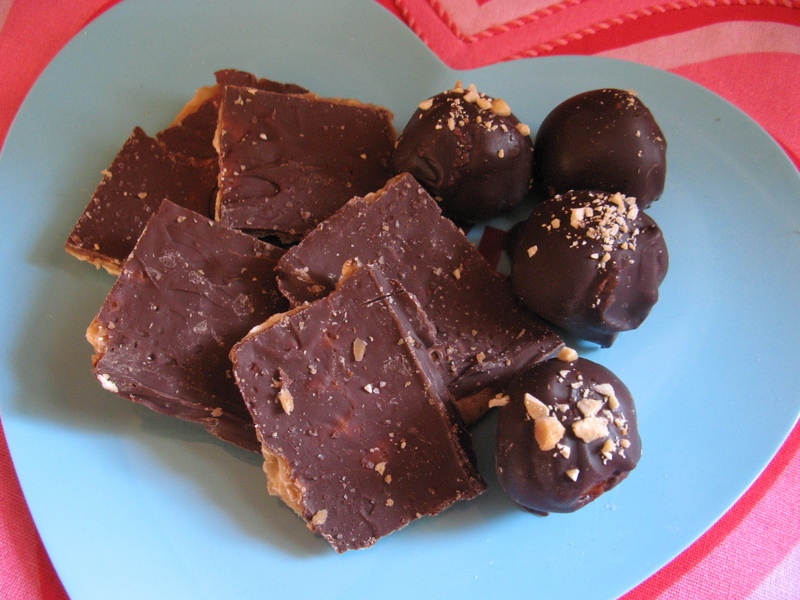 Well, I have two quick and easy treats for just that… Matzo Crack & Chocolate Peanut Butter Cheesecake Truffles. For the Matzo Crack, you start off by making a simple toffee using butter and brown sugar. Which you then spread over matzo crackers that have been arranged in a single layer on an aluminum foil lined baking sheet. Pop it in the oven for about 10 minutes, remove and then spread a bag of chocolate chips – semi-sweet, milk or dark – over the bubbling toffee. Let it sit for a few minutes and then using an off-set spatula smooth the chocolate over the toffee. Sprinkle with seat salt (and nuts if you like) and refrigerate for about 45 minutes. Once the chocolate has hardened transfer to a cutting board and cut into pieces. The truffles are just as easy… After making the filling – beat cream cheese, peanut butter, graham crumbs, sugar and peanuts together – roll it into 1-inch balls and freeze for about 10 minutes. Melt the chocolate and dip each of the balls in the chocolate, sprinkle with chopped peanuts and refrigerate until firm. There you go… two quick, easy and delicious treats that you can enjoy this Valentine’s Day or any day! Preheat the oven to 350 F. Line a baking sheet with aluminum foil – make sure the foil goes up and over the edges of the pan. Top the foil with parchment paper. Cover the paper with the matzo, cutting and piecing the pieces together. Scatter the chocolate chips over the hot toffee, let it sit for a few minutes and then using an off-set spatula spread the chocolate in an even layer over the toffee. Sprinkle with the sea salt and nuts (if using) and place in the refrigerator for about 45 minutes. Don’t let it stay in the refrigerator too long or it will be more difficult to cut. Using the overhang aluminum foil transfer the matzo crack to a cutting board and cut it into pieces. Store in an airtight container in the refrigerator. Beat cream cheese in a large bowl until creamy. Add in the remaining ingredients, except the sugar, and continue beating until all ingredients have mixed together. Roll the cream cheese mixture into 28 balls, using about a tablespoon of the mixture for each ball. Place on a waxed covered baking sheet and freeze for 10 minutes. Meanwhile, melt the chocolate. You can melt it in the microwave or using a double boiler. Dip the cream cheese balls into the chocolate and transfer them back to the wax-lined baking sheet. Sprinkle with the remaining chopped peanuts and refrigerate until firm, about an hour. If necessity is the mother of invention is it safe to say then that random leftover ingredients are the building blocks to great recipes? Just a thought! And when I say leftover, I mean leftover, half finished, not wanting it to go bad, and somewhere in the middle of all that ingredients. That’s pretty much how this Banana Ricotta Cheesecake came about. I had a container of ricotta cheese in the fridge that was quickly approaching its expiration date and two bananas on the table that were quite ripe and I just didn’t feel like making pasta or a banana bread. After some Google searches I couldn’t find anything that I really wanted to make or I found recipes that required ingredients I just didn’t have on hand and didn’t want to buy. So, I figured since I bake enough it was about time that I tried going without a recipe, okay, not completely without one. 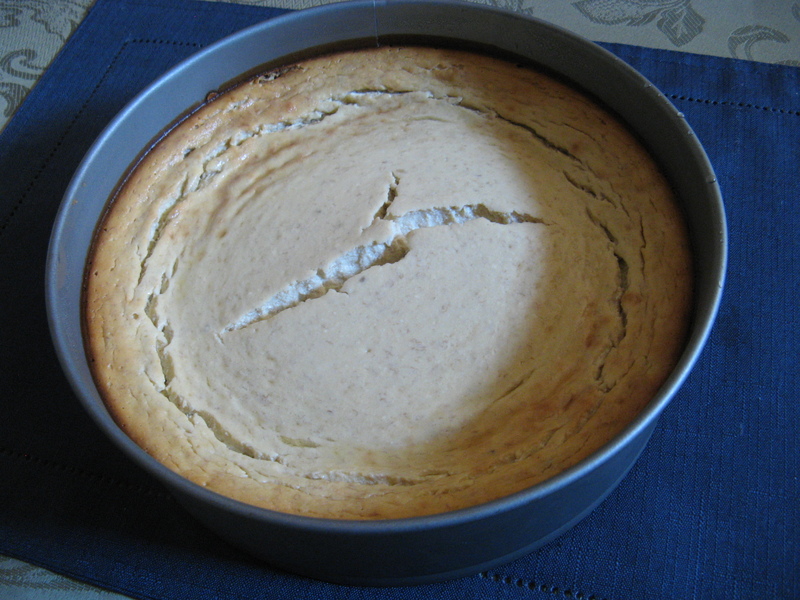 I did some major tweaking to a Ricotta Cheesecake I had made before. But, I think this is still somewhat original. Unfortunately, my cheesecake did crack in the middle. It wasn’t so bad when I first took it out of the oven, but, as it cooled it got bigger. Oh well! But, after slicing it and plating it with chocolate sauce and whipped cream that unfortunate crack was nothing to be bothered by as I am happy to say I was quite pleased with how the cheesecake came out. The banana flavor was subtle but still detectable, not as strong as banana bread but not as faint as a hint. 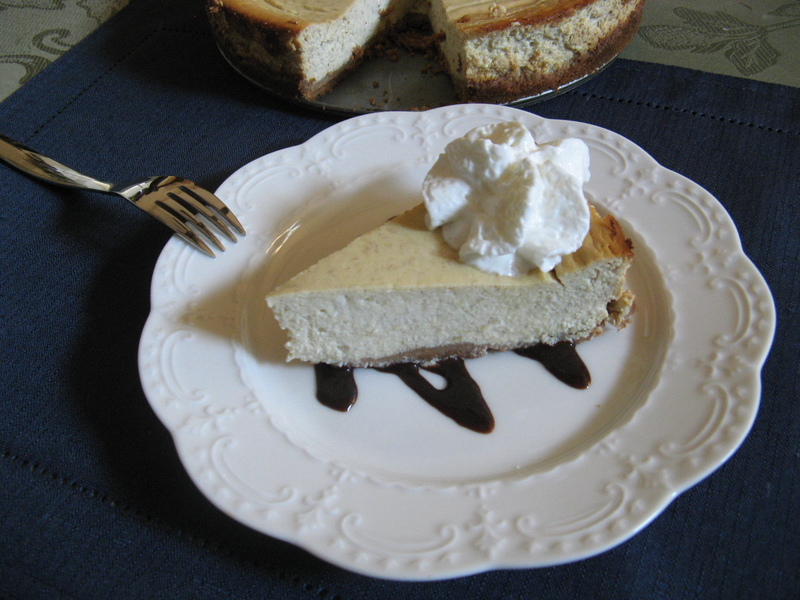 And no, in case you are wondering there were no traces of banana in the cheesecake itself since I was sure to blend the mashed banana, sugar and cream cheese until they were smooth. Process the graham crackers in a food processor until they become fine crumbs. Add the butter and process until blended. Pat the crumbs into the bottom and halfway up the sides of a 9-inch springform pan. Place on a baking sheet and bake for 10 minutes. All to cool completely. In a large bowl, beat the mashed bananas, cream cheese and sugar with an electric mixer until smooth. Add the ricotta and vanilla extract and continue beat until smooth. Add the eggs 1 at a time, beating well after each one. Pour the mixture into the cooled crust and bake for 50 – 60 minutes. Until a cake tester inserted in the middle come out clean. Cool on a wire rack for 45 minutes, then refrigerate and chill for at least 2 hours. Serve at room temperature. 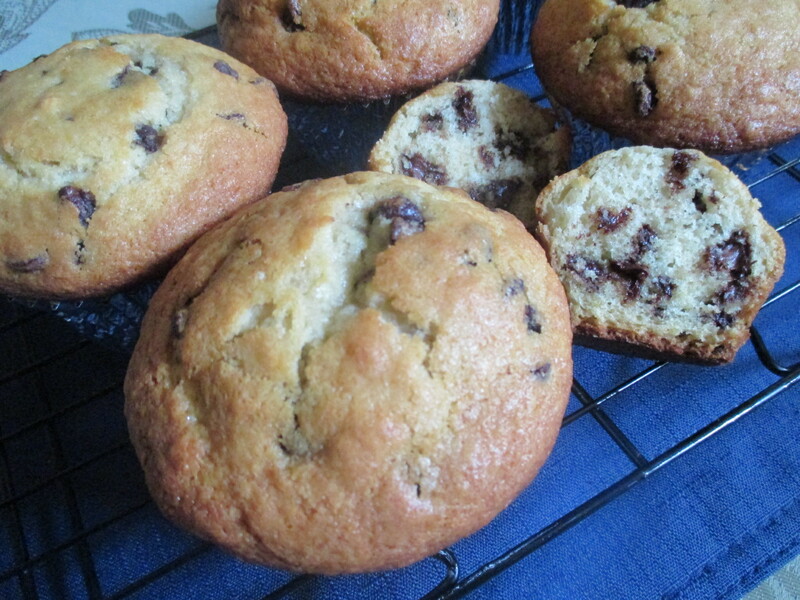 It seems like I am on a muffin kick… Last week I brought you Blueberry Crumb Muffins and this week I am bringing you Chocolate Chip Muffins. The real reason why I made these muffins… I was going on a road trip and thought they would be a good snack/treat/breakfast for the road. When you have chocolate chips in a muffin they can be for anything I think. While this recipe was written for 12 servings (aka a cupcake size muffin) I opted to make 6 large ones as I didn’t want that many muffins for the road. Preheat the oven to 425F and line a muffin tin with liners and then spray it with baking or cooking spray. This is just in case the muffins bake onto the pan so you can easily remove them. In a large bowl mix together the flour, baking soda, salt and chocolate chips, set aside. In a medium bowl whisk together the melted butter, sugar, eggs, milk and vanilla extract. Slowly add the wet mixture to the dry mixture and fold together until just combined. Divide the batter among the muffin cups and bake at 425F for 5 minutes and then lower the oven to 375F and bake for another 12-15 minutes, or until a cake tester comes out clean. Let cool in the pan on a wire rack for about 10 minutes and enjoy!